PVS and host clubs along with their Meet Directors are committed to the Inclusion Policy as adopted by the BOD . Athletes with a disability are welcomed and are asked to provide advance notice of desired accommodations to the Meet Director and PVS Age Group Chairman (Greg York at gjyork@comcast.net). The athlete (or the athlete’s coach) is also responsible for notifying the session referee of any disability prior to the competition. Contestants must have equaled or bettered the applicable no slower than (NST) LCM times listed or the 2005 "AAA" or better short course times. Qualifying times must have been achieved subsequent to July 12, 2003. Short course entry times are non-conforming times and will be seeded after long course entry times. All individual events 200 meters and shorter are trials and finals. All relays and individual events 400 meters and longer are timed finals events. For all prelim/final events there will be 1 final heat for 10 & Under events. For all prelim/final 11-12 and 13-14 events , there will be 2 final heats, swum fastest to slowest. The 10 & Under Freestyle 400 Freestyle, and 14 & Under 800 and 1500 Freestyle events will be swum fastest to slowest. The 14 & Under 800 and 1500 Freestyle will alternate women and men. The fastest heat of the Women's and Men's 800 Frestyle will be swum as the first event of the evening program on Thursday. The 13-14 400 Freestyle may have up to the two fastest heats swum in finals. A determination will be based once the timeline for Friday's preliminary session is known. Swimmers in the 800 and 1500 Freetyle events are responsible for providing their own timer, except for those in the fastest heat being swum as part of Thursdays finals. All 200 and 400 meter relays are timed finals and will be swum in preliminary sessions. 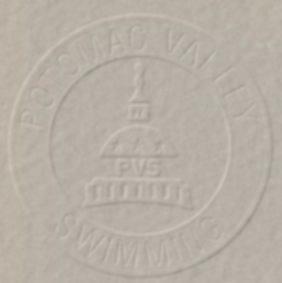 Tthe 13-14 800 Freestyle Relays will be swum as the last event on Suniday evening, and will be swum fast to slow..
All certified officials wishing to volunteer to work this meet please contact the PM Officials Chairman, Peter Nichols at 703-255-3779 or email royall@gwu.edu prior to July 17. Please include your club affiliation, certifications held, and sessions you wish to work. Officials volunteering should sign in at the recording table prior to the start of Warm-ups. Certified officials who have not previously advised of their availability may volunteer their services to the Referee at this time. Entires may be submitted (1) manually, (2) by sending a disk to the meet director or (3) via e-mail. Follow the instructions under the appropriate heding below. The immediately following rules apply regardless of method chosen. Individual or unattached entries will only be accepted by manual entry sent to the address listed below or by e-mail containing all the particulars required by the master entry sheet. Manual entries must be submitted on the PVS master entry sheet. Also submit a completed "entry cover sheet". Signature and phone number of a club official must be included with entry for validation of entries. Short course entry times must be designated with a capital letter "Y". All relays may be submitted in Hy-Tek (commlink II file) or on PVS master entry sheet. Optional: Before preparing your entries, events for this meet can be downloaded and then imported into team manager. (download "60mm072105.zip") (NOW AVAILABLE) unzip it and then go to team manager/file/import/meet events). To download as a file, you may need in Netscape to right click on the mouse and select "Save Link as" and with Microsoft Explorer right click on the mouse and select "Save Target As"
Clubs submitting by email should submit entries to coach_bill@verizon.net, in the subject heading type, "2005 PVS Long Course Age Group Champs - ****" with the club's initials substituted in place of the asterisks. The meet director must receive all entries for this meet no later than 5:00 p.m., Tuesday, July 12, 2005. $ Timed finals. Heats swum from second fastest to slowest in prelims. Fastest heat will be swum as the first event in the finals session. Verification of time required. ^ Timed final event. Meet Director will determine based on timeline whether up to two heats are swum in finals.